Viewing 24 of 111 items. 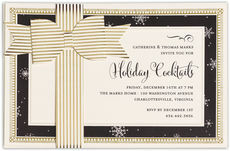 These invitations feature a printed invitation on ivory cards inserted into a shiny gold stripped ribbon die-cut wrap. Invitations measure 7.75" x 5.25", Invitations, envelopes and diecut.. 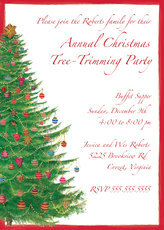 These invitations feature die-cut christmas tree cards with foil accents attached to printed invitations secured with satin ribbons. 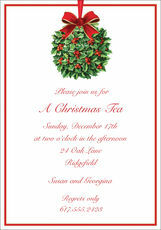 Invitation size is 4.5" x 5.5". Invitations, envelopes,.. 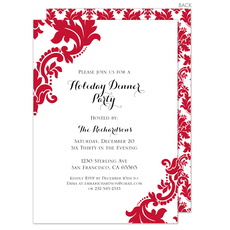 These invitations feature a printed invitation inserted into a matte die-cut side pocket embellished with pre-tied red satin ribbon. Invitations measure 7.75" x 5.25". Invitations,.. 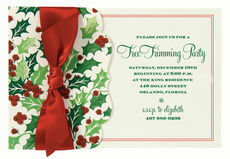 These invitations feature die-cut holly cards with foil accents attached to printed invitations secured with satin ribbons. 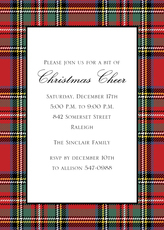 Invitation size is 4.5" x 5.5". 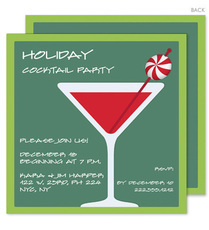 Invitations, envelopes, diecuts..
Set of 20 flat holiday invitations with matching blank envelopes included. Card size is approximately 5.25" square. Imprint is flat printed in white ink color as shown.Return address available.. 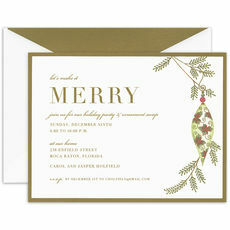 This beautiful gold foil stamped frame and geometric design border will add a modern touch to your holiday party. Size 5.625" x 7.5". Printed in raised ink color of your choice. 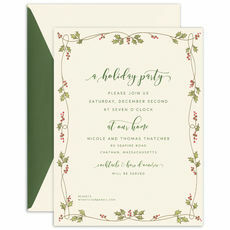 Matching..
A festive holly border with gold foil stamped vine frames your holiday party details for your friends and family. Size 7.5" x 5.625". Printed in raised ink color of your choice. Matching.. 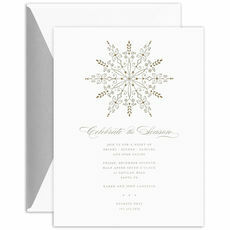 This beautiful engraved snowflake design lets your guests know the details of your upcoming holiday event. Size 5.625" x 7.5". Printed in raised ink color of your choice. 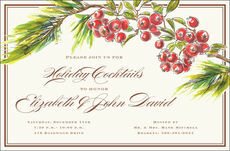 Matching blank..
A series of festive ornaments hang above your custom text on this vibrant and whimsical holiday invitation. Each ornament has a gold foil stamped accent. Size 7.5" x 5.625". Printed in.. 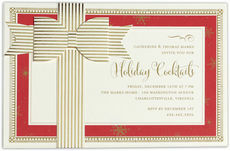 These invitations feature a printed invitation inserted into a die-cut pocket in the shape of a pair of Candy Canes. Invitations measure 5.25" x 7.75". 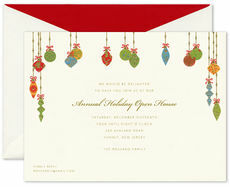 Invitations, envelopes and diecut pockets are..
Hosting a Christmas party this year? The season is finally here. 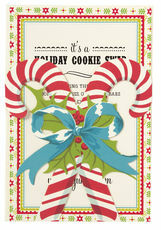 There is so much to do from holiday shopping to decorating the house to baking cookies! 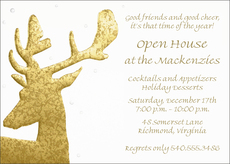 So make your holiday party planning a little easier and see our exceptional selection of holiday and Christmas invitations. 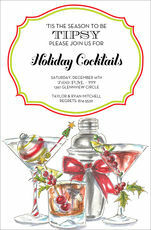 Whether it’s a cocktail party, a holiday open house, a formal dinner or an ornament-exchange party, we have a Christmas invitation that will be perfect for your needs. 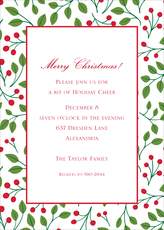 The right Christmas party invitations give your guests an idea of what to expect when celebrating the holidays at your house or another fun venue. With personalized party invitations from The Stationery Studio, you have the freedom to pick a design that works for your event and customize the card with all the information you need. You can let your guests know what time the party starts, the location of the event and even whether they need to bring something special such as a present for a gift swap or cookies to share. 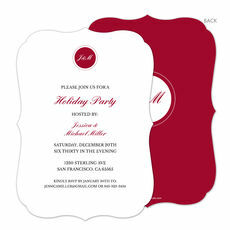 From classic and traditional party invitations that incorporate festive shades of red, green, gold or silver with a cream or white background. You might also look for invitations that incorporate bright shades of pink, aqua and other unexpected colors to really help your cards stand out among all the holiday invitations guests receive. 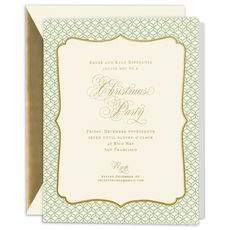 You'll also find a number of invitations that use the traditional Christmas colors and motifs of the holiday. 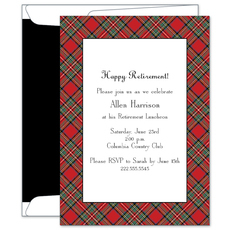 Our invitation designs come with matching envelopes that make it easy to get your cards in the mail fast. 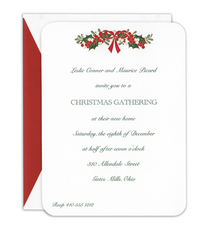 With the holidays quickly approaching, you'll want to customize your design and place your order soon to give yourself enough time to notify all your guests. Some of our top designs feature champagne glasses, Santa Claus, Christmas trees and other decorations, so you have many options to find one that matches the theme and feel of your holiday party spent with family and friends. We also offer a large selection of personalized party supplies that will make your celebration memorable. From party favors to personalized Christmas napkins and guest towels, printed party plates and disposable cups, we make it easy for you to make your upcoming celebration very special.